Most people probably believe that debtors’ prisons are ancient history, but since the 1970’s in the United States, more and more American citizens have been thrown in jail over private debts. And in the last few years, judges have increased the number of people being put into prison because they can’t pay their debts. According to a recent report by the ACLU, more and more American citizens are being thrown into prison by judges who say that private debt held by collection agencies is now a criminal offense, which most legal experts agree is a clear violation of the equal protection clauses of the Fourteenth Amendment. But as the corporate stranglehold on American life gets tighter, it is becoming increasingly clear that corporations always get what they want, and right now they want Americans put in jail if they aren’t paying their debts. Ring of Fire’s Mike Papantonio and Peter Mougey discuss this. 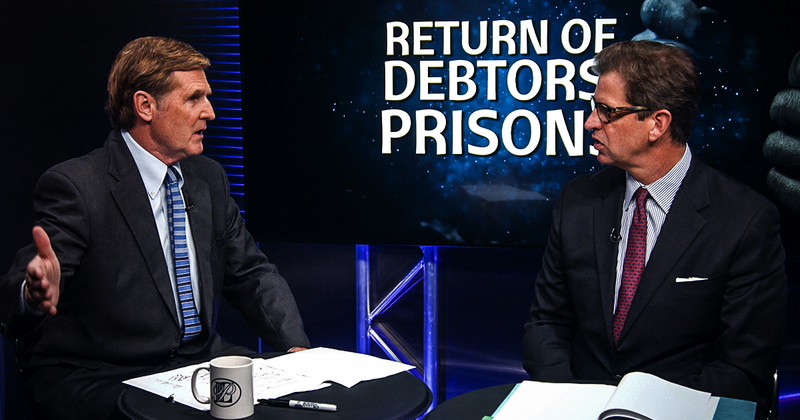 Mike Papantonio:	Most people probably believe that debtor’s prisons are ancient history. But since the 1970s, the United States more and more American citizens have been thrown in the jail over their debts and private debts, by the way and in the last few years, judges increased the number of people being put into prison because they can’t pay their bills. According to a recent report by the ACLU, more and more American citizens are being thrown into prison by judges who say that private bills held by collection agencies is now a criminal offense, which most legal experts agree is a clear violation of the equal protection clauses of the 14th Amendment. But as the corporate strangle hold on America gets stronger, it’s becoming increasingly clear that corporations always get what they want. Very rare that they don’t get what they want and right now, they want to put Americans in jail if they’re not able to pay their bills. Peter, when I looked at this story, looked at these headlines, I’ve been hearing this story for quite some time where for criminal offenses, the people that can’t pay child support, whatever it may be, it evolves into a criminal offense and they’re thrown into prison, in jail for that. But this is much different. This is somebody’s got a hospital bill, for example. They can’t pay the hospital bill and they end up going to jail for it. The ACLU has followed this a long time and now, I mean, thousands of cases of this happening. What’s your take? Peter Mougey:	They’ve documented a lot of really horrific stories. I mean, what’s really happening is that this industry from the legal perspective, these huge firms that pay their lawyers almost nothing, it’s just a machine where they’re turning out claim after claim and then they send a notice to somebody that hasn’t paid their hospital bill or bounced a small check and the defendant doesn’t show up for the court hearing. So if they don’t show up for the court hearing, as you know, then the court enters an order and it can be contempt, which can be criminal and then they don’t get the notice. They don’t show up. They get another notice of contempt. It goes on their record and then an arrest warrant is issued for failure to appear. But think about the kind of people that can’t pay their hospital bills. They don’t have insurance. they rent. So they move a lot. Peter Mougey:	So it’s hard to find them and then they get pulled over for a speeding violation. Mike Papantonio:	And they got a warrant. Peter Mougey:	And they get thrown in jail and they can’t get out because they can’t pay the bail and this might all over be, like you said, a hospital bill or some bounced check for a pizza or something ridiculous and then they’re sitting in jail. Mike Papantonio:	Well, I mean, think about this. Would you ever believe that an inability to pay a bill, like a hospital bill could end up [crosstalk 00:02:36] could land you in jail? But this takes cooperation. You see, this is what everybody … This takes some cooperation with the prosecutors and with the judge. Now these are criminal prosecutors that are kind of helping in all this and here’s how it work. I mean, you show up. You’re supposed to get a notice. First of all, they gotta give you notice that there’s a hearing, right? Mike Papantonio:	A lot of people get this in the mail and it looks stuff mail. It looks like irrelevant kind of mail. Peter Mougey:	Or you’ve moved because your lease is up or you got evicted. Peter Mougey:	Yeah, I was really troubled by the fact. I had no earthly idea that some of these companies actually contract with the prosecutor’s office. I had no earthly idea that there was an agreement between the bill companies and the prosecutors and that there was a quid pro quo and back and forth. That just seems to violate just, not only common sense, but to have the prosecutor in a criminal side to help actually pushing the civil claim through criminal means, like failure to appear. That just seems like it turns it upside down. 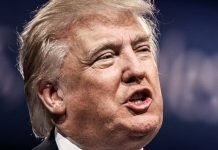 Mike Papantonio:	Well, one thing is clear. One of the stories here, this is a very typical story that the ACLU uncovered. Woman, she owed a hospital bill. She was deathly ill, had a hospital … Matter of fact, she left where she was living to go live with her parents so she could recover. Mike Papantonio:	Okay? So they supposedly send her this notice. “You’re in default on the bill. You have to show up in court for a post default hearing.” She doesn’t even get the notice. So one night in her pajamas at her mother’s house, she’s literally in her pajamas, knock on the door. They’re there to arrest her in front of her 12 year old daughter and eight year old autistic son, four year old son as well. So they haul her away and she spend time in jail because she can’t even make bond to get out of jail. The problem is this, again, I can’t say this enough, this doesn’t happen without really second rate, bottom feeder lawyers and judges being involved in this. Peter Mougey:	I mean, to have arrest warrants issued in a debt case is one way to kind of clean this up. You just can’t have arrest warrants issued. You can have civil contempt, which is different. But you can’t have arrest warrants issued for failure to appear. I mean, the lady you just mentioned, she was recovering from cancer. Then she lives with her parents because she can’t afford it. She moves out of her place and she ends up staying in jail because she can’t get out. I mean, the ACLU’s come up with a couple of guidelines and one of those is no more contractual relationships between the district attorney’s office with private check collection companies, which is a little scary to start and that courts can’t issue arrest warrants in debt collection cases. That seems kind of like common sense. I mean, debtor’s prisons are hundreds of years ago. Mike Papantonio:	Yeah. Look, I would say for 50 or 60 years, this type of thing could have been done. Mike Papantonio:	But maybe you had more responsible lawyers. Maybe you had more responsibly judges who weren’t willing to say, “Yeah. I’m gonna go along with this.” Can you imagine a state paid prosecutor having a contract with a private entity, a debt collection. “Yeah, I’m gonna help you out. I’m gonna throw these deadbeats in jail.” That’s basically what this has come down to. Peter Mougey:	No, absolutely. It really doesn’t seem that controversial, that we should be throwing people in jail. Another thing, another way to deal with this is you gotta hold people accountable, right? You need them to show up for court. I mean, that’s pretty much common sense. Mike Papantonio:	But you gotta give them notice. Peter Mougey:	That you gotta give them notice and even if they get notice, you have to have evidence. But what a waste on our system that we’re sending police officers out to go arrest people like that lady that you send a police officer over an unpaid medical bill. You take the resources from the county to go arrest her and then you put her in jail and you take her out of it [crosstalk 00:07:47]. It is and she’s never gonna pay back the bill.